The Jig Rig is the ultimate for fishing soft plastic baits along the bottom. The slim-profile tungsten weight, with bait in tow, drops straight down, penetrating vegetation until you feel it hit bottom. Then, as you slowly retrieve the snagless rig over bottom contours, your bait, rigged on a hook that pivots independent of the weight, freely moves about, tantalizing even the most wary bass. With the weight leading the way, the compact profile of this rig allows for longer, more accurate casts. Weights can easily be removed and added to the split ring without re-tying line or re-rigging bait. 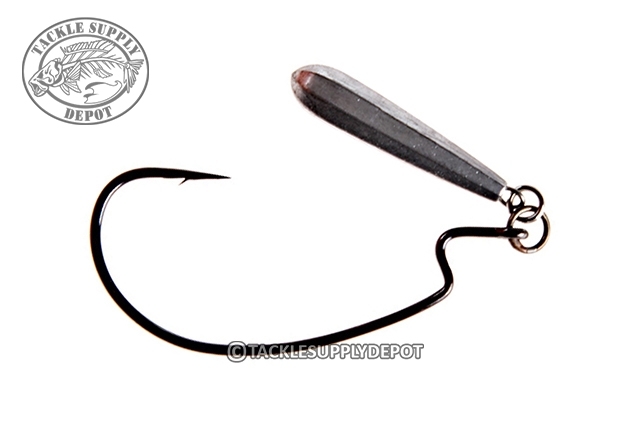 Perfect for Texas Rig'N, the light wire hook (Attached to a solid ring) features an extra wide gap, Z-lock shoulder bend, Super Needle Point, and Black Chrome finish.